Small, scented, deep-rose, single flowers on a low growing plant suitable for prostrate training. Flowers in October/November. 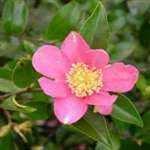 I have just received a "Tanya" camellia from Trehane and was very satisfied with the whole process from ordering to delivery. The Trehane website was easy to work with for a foreigner like myself, and DHL did a good job delivering the parcel to my doorstep. I have shopped here before, and expect to do so again! This Camellia is just what I wanted to provide some additional colour in the garden in the autumn. The plant arrived safely, was very well packaged and is very healthy. quick delivery, very good packed, good quality plant.